Huzzah! 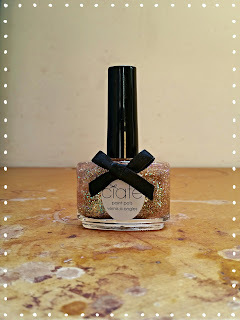 It's a polish post, and today we have Ciaté Party Shoes. Now Ciaté I am finding at a discount everywhere, from TKMAXX to Moneysavingexpert.com (brilliant deal on a gel nails kit there at the moment), and this the Boy picked up for me for £2 in London *joy*. 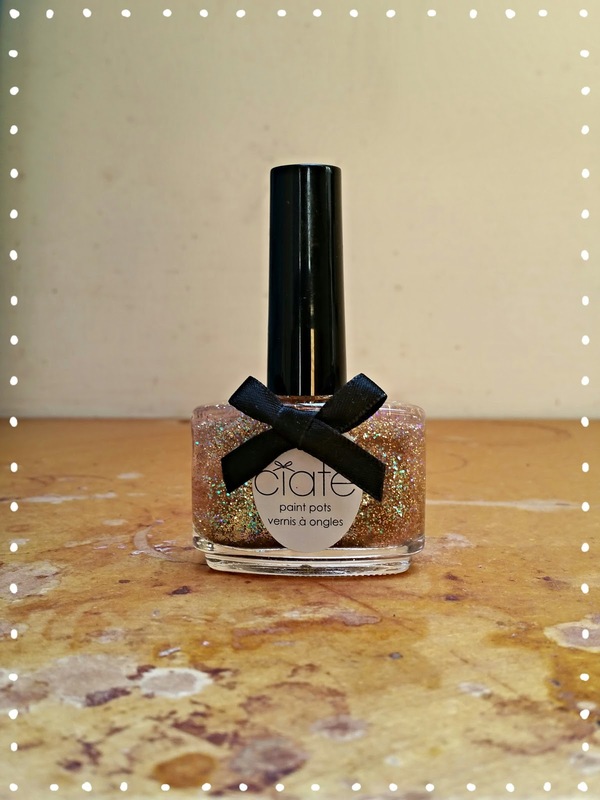 I do so love Ciaté, with the bows and the elegant bottles, but I've found the formula will chip easily despite having a top coat on. This so far is surviving, but I'm only one day in. A lovely sparkly joy in a bottle, I love the blue holo flakes in amongst a sea of gold micro glitter. 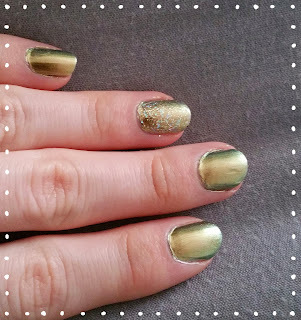 I'm currently wearing it over OPI Just Spotted the Lizard (Ciaté Oil Slick is an amazing dupe for this if you missed out on the Spiderman collection), and it looks very glitzy indeed. 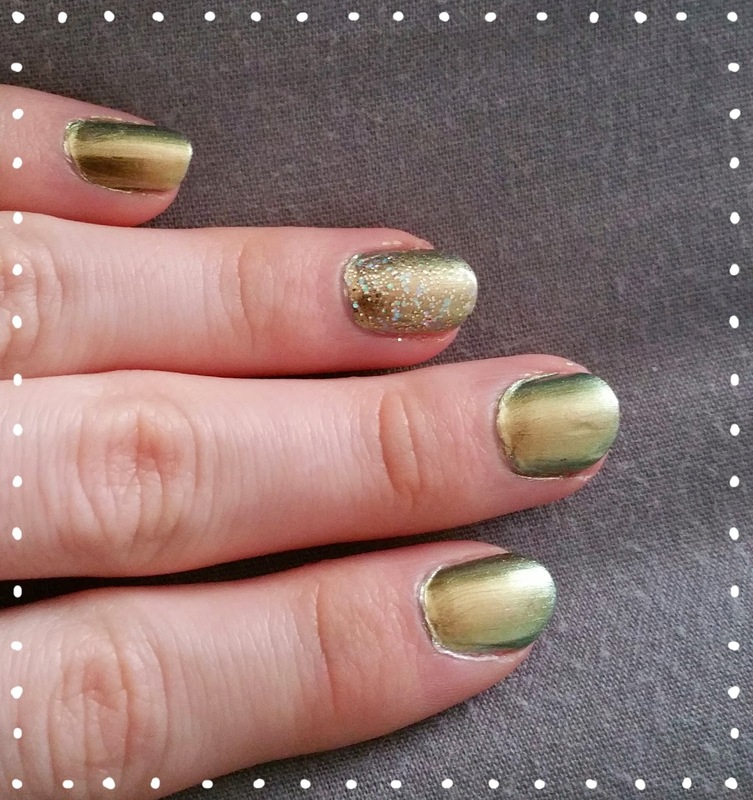 I'll be trying it again over other colours as a contrast at a later date, but with colour shift it makes a nice subtle alternative to ring finger nail art. It is a little gritty, so you're going to want a top coat, but once that's on it'll settle and you'll be ready to party! I can see this working well for Christmas time, but who says you can't be a bit sparkly in the spring sunshine too? Speaking of topcoat I'd like to mention the amazing Seche Vite here. Cheekily painted these at work on my lunch break, and within fifteen minutes was back on the floor knocking links out of a watch bracelet. 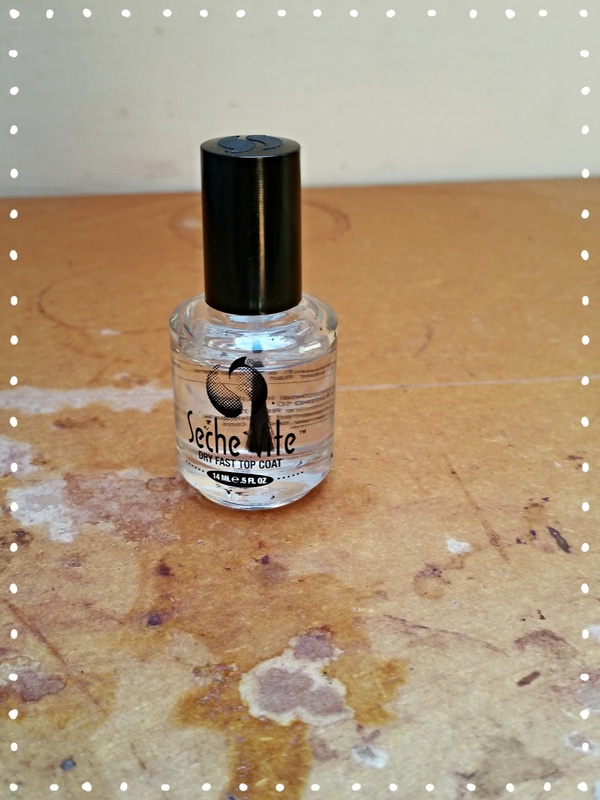 It is the ultimate quick dry ultra hard top coat.I know many of you out there are familiar, but I mentioned it at work and no one had heard of it, and if it hadn't have been for beauty blogs singing its praises neither would I, so I'm promoting here again. I found my bottle in TKMaxx, but if your luck is running low you can always find it on amazon.com for approximately £5. The highly chemical smell was a shock to me, but once you get over that this stuff is gold dust for those ladies who want to just get on with life instead of sitting and flapping their hands. So yes! Boy did good with my little bottle of shimmery goodness, and Seche Vite is awesome. What about you guys? Will you be donning spring/summer time sparkle, or is this a strictly Christmas thing?